Johanna Konta says she is embracing the opportunity to play at this week's WTA Moscow. The Brit made a winning start to her maiden trip to Russia, beating Belgium's Elise Mertens 6-3 7-5 to book her place in the second round where she will face either Australian Daria Gavrilova or home favourite and lucky loser Vitalia Diatchenko. Konta looked sharp, blasting 28 winners, helping her exploit an uncharacteristically poor serving performance from the world number 16. After opening round defeats in both Wuhan and Beijing, the British number one was in need of a confidence building result and will be keen to kick on, with either Kiki Bertens or Aliaksandra Sasnovich waiting in the quarter-finals. I'm excited, and wanting to make it a full week. While other players are looking to book their places in next week's WTA Finals, Konta is instead hoping to build some momentum towards next year and January's Australian Open. A fourth WTA Tour title would certainly boost her belief and she was understandably delighted with her performance on Tuesday. With things clicking both on and off the court, the 27-year-old says she is relishing the prospect of going deep this week. "I'm obviously really happy with my performance, and to get a win like that against a player like [Mertens] this year is obviously a great boost for me," Konta told the media, after her victory. "I'm really happy that I'm just able to set up another opportunity to play another match here. "I'm really happy to be here! I've never been to Russia before, so to be here for the first time, I'm excited, and wanting to make it a full week." 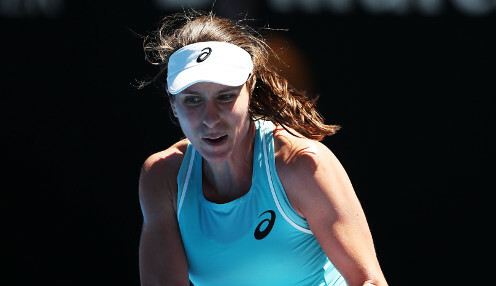 Konta is 50/1 to win next year's Australian Open, while she can be backed at 33/1 to triumph at Wimbledon.